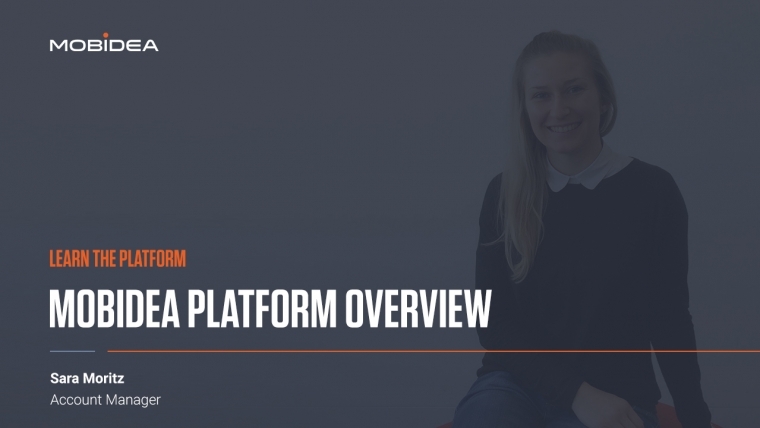 I am Sara, an Account Manager in Mobidea, and I am going to give you now an overview of our Mobidea platform. Let’s first take a look at your dashboard. Your dashboard gives you an overview of your activity within the time frame selected in the drop down menu on the top left corner. You will see your visits, signups, average CR and EPC, as well as your total revenue in that period. Additionally, you have a graph showing how your sign-ups and revenues evolved over time. Below this graph you can see the top performances in your account for the selected period. You can choose to see top countries, operators, offers or campaigns. The campaigns will only have data if you make use of our integrated tracker capabilities though. To learn how to use Mobidea’s tracker capabilities, check our other tutorials. On the left, you have the main menu of your account. In “Tracker” you can find all the stats of your account, as well as the option to set up campaigns in our tracker. In “Opportunities” you can find full stats of all offers and Smartlink segments in Mobidea – so this is the place to find the next top offers you should test! In “Smart Tools” you can find all your Smartlink settings, and in “Offers” you can find descriptions of all available offers. This is also the place where you apply for offers before you can run them. If you want to request a payment or send money to another affiliate, you can use the “Cashier” section below. If you have a dedicated Account Manager, his/her contact details will show up here as well. I hope this helped you navigate through our platform easily from the start. Make sure to also check out the other tutorials we have for more details.